"Chris Batha is one of the finest shooting instructors in the world today, with over thirty years wing-shooting experience gained on the finest sporting estates and shooting schools in Great Britain. It is of little wonder that demand for his schools and seminars is so great." 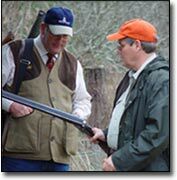 International Senior Shooting Instructor and Master Gunfitter for E. J. Churchill Gunmakers. He conducts shoots and schools in over a dozen premier venues in the United States as well as giving individual instruction in the UK at the West Wycombe Shooting Ground. As the Master Gunfitter for E. J. Churchill, he carries out gunfittings for bespoke Best London Guns as well as individual custom gunfits in both the U S and the UK.